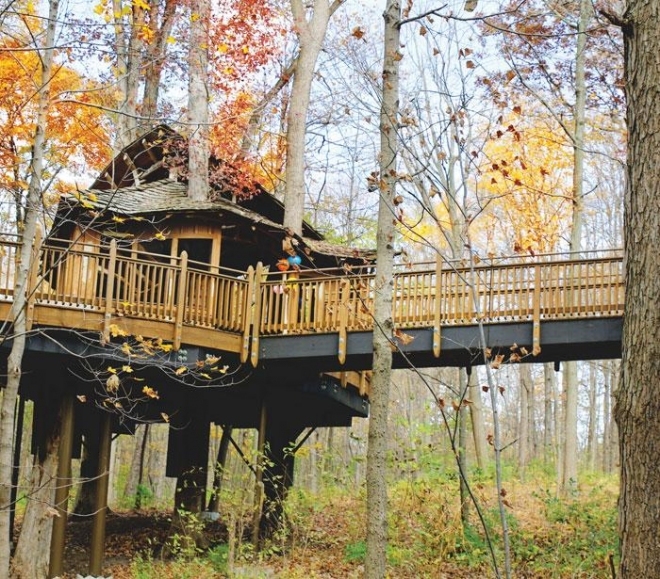 Hidden in the largest city park in Cincinnati is a magic treehouse. Few know about it, but those who do come from all over to live out childhood dreams. This otherworldly, elevated structure buried in trees and seemingly snatched out of a fantasy novel is the Mount Airy Treehouse. It’s located in Mount Airy Forest and has a sign that reads “Everybody’s Treehouse” at its entrance. Guests must first traverse a uniquely engineered ramp attached to live trees with joints that move. This leads to a deck and the treehouse itself, a sight to behold with many oversized windows and a few tree trunks growing right though its middle. Larry Parker, west region manager of the City of Cincinnati Parks Department, describes its whimsy. “It kind of looks like there might be a troll or somebody living out in the middle of the forest in there,” he says. Trolls or otherwise, the treehouse is completely free and open to the public. It’s a viable space for those that are seeking solitude or wanting company. Readers, wanderers and party hosts alike can all make use of it. According to Parker, the treehouse came about as a vision from Michael Flannery at WCPO at the time. He was contacted by a family — the grandmother had the idea that all children should be able to climb in a tree somewhere. Flannery worked with the Parks Foundation, Cincinnati Rotary and Forever Young Treehouses — who designed the treehouse — to turn this vision into reality. The treehouse was completed in the fall of 2006. Since then, it has attracted a constant stream of visitors. Parker says the treehouse is extremely dynamic and fluctuates with the seasons as the foliage, animals and weather conditions change. The treehouse is open year-round, except occasionally in the winter if the weather is bad enough. Another part of the treehouse’s magic is that it’s universally accessible, meaning that those in wheelchairs can easily navigate it. In fact, it’s the only treehouse in Ohio that has this level of accessibility. Emily Ash, who uses a wheelchair, hosted a potluck at Mount Airy Treehouse in the beginning of fall. She heard about the treehouse when a friend sent her an article about it over Facebook. She says she loved the experience of hosting a potluck there even though there were strangers coming and going — it’s a completely public space that can’t be reserved. Kendall Jolley, a potluck guest, says the treehouse brought back memories of her tree-climbing days as a kid. It was her first time in a treehouse, though she had imagined being in one in her younger years. She says the accessibility aspect is hugely important. “I’m constantly thinking about the events I’m going to and planning in Cincinnati now and hate that so many of them are still inaccessible to people in wheelchairs (or with other mobility challenges) due to our old buildings and ableism,” Jolley says. With universal accessibility, multiplicity of uses from bird watching to secret meetings and absence of charge, Mount Airy Treehouse truly is everybody’s treehouse.